The fact that somebody shoots a gun is of no interest. What I want to know is why he shoots it and what the consequences are. The typical Zinnemann film reaches a climax when a clock ticks away the seconds while the protagonist – Gary Cooper or Audrey Hepburn or Jane Fonda – struggles with the enemy within, and somewhere close by there’s a locomotive coming. In Fred Zinnemann’s body of work – twenty-two feature films and nineteen documentary shorts – there are notably few guns but many trains, remarkably little romance or outright comedy, but much searching for consequences and externalising of interior dramas. Zinnemann’s first directing credit comes exactly half a century before his last. In between, he won all the big awards, including four for Best Director from the New York Film Critics, and five Academy Awards (including Best One-Reel Short in 1938 and Best Short Documentary in 1951), plus the D.W.Griffith Award of the Director’s Guild of America in 1970, and the Lifetime Achievement award from the Berlin Film Festival in 1994. However impressive awards may seem, his most famous titles – High Noon, From Here to Eternity, A Man For All Seasons – also struck a chord with mainstream audiences, catching the post-war spirit of questioning society during the ostensibly complacent 1950s. These titles, which enjoy enduring popularity, have taken their place in the canon of official classics, with ample literature by both champions and detractors that debates their merits from various angles. Realizing the self, struggling against pressures both public and private, constitutes the goal of Zinnemann’s characters. This could mean facing one’s own cowardice (Act of Violence), or betrayal by the body (The Men), or fear in the light of duty (High Noon), or social pressure from the group (From Here to Eternity), or addiction (A Hatful of Rain). When this director holds a close-up, it most often shows the character struggling to understand, whether it is a despondent and exhausted little boy (The Search), a teenaged girl who keeps trying on personas like hats (The Member of the Wedding), or the adult playwright still immature from not having pushed the limits of her principles (Julia). To approach Fred Zinnemann’s work the conventional way is to trace its historical or cultural impact, or how individual films enlivened genres like the western or film noir, or how his performers achieved a rare intimacy onscreen. Yet this approach often reduces Zinnemann’s themes to watery pieties about conscience, with misleading religious and political implications. When Zinnemann deals with religious practices in The Nun’s Story and A Man For All Seasons, he casts a highly sceptical and rationalist eye on them. Zinnemann’s world is a tougher place than traditionally described and full of hard lessons. Don’t expect the law to protect you (High Noon), anymore than the institution to which you’ve committed your life (From Here to Eternity), and certainly not government apparatchiks (Day of the Jackal). The drive to power is always prepared to murder those in its way (A Man For All Seasons), while religion works more like a cult than a realistic way to deal with the world (The Nun’s Story). Life is a cycle where loved ones come and go (The Member of the Wedding), so at least be good to each other and fight the forces of darkness (Julia). If you don’t, you’ll regret it a lot (Act of Violence). Clear symbols of this worldview appear in High Noon (1952) when the town judge folds up the American flag and packs it away with the scales of justice. That is before the marshal flings the tin star of his authority into the dust. Yet political interpretation misses the mark because the individual’s integrity to self is what interests Zinnemann, not any political analysis or soapbox zealotry. Again, High Noon holds the proof since, through the years, this film has served many masters and fit opposing ideologies. Perceived at the time of its release as a leftist parable about blacklisting, it now seems like a plank from a right-wing ideology of self-defence, complete with a critique of judges who parole dangerous criminals. The director himself noted that the film’s “popularity waxes and wanes; people become very aware of it at times of decision, when a major national or political crisis is threatening” (2). A similar shapeshifting happens with A Man For All Seasons (1966), whose arguments about the dangers of absolute power have appealed to libertarians. Nor was it a surprise that the Vatican publicly praised the film’s defence of moral authority, while National Review magazine named it the best conservative movie ever made (High Noon comes in at number 57) (3). Nevertheless, one need only squint slightly to see another leftist metaphor for America’s McCarthy era, given the film’s “atmosphere of spying and paranoia, of interrogation and the taking of oaths” (4). Though wreathed in official awards, A Man For All Seasons has emerged as an anti-auteurist landmark, partly due to its disreputable genre, the costume biopic embodying the Great Man model of history, while alternating high-minded rhetorical debates with domestic squabbles. The objection to these adaptations of literary and theatrical properties is that Zinnemann’s visual imagery only serves to enliven the dialogue, thus functioning like lipstick on the corpse. Is Zinnemann a great director? His claim to innovation was his application of Robert Flaherty’s principles and neo-realist practices to studio-bound film production. In contrast, his contemporaries – Nicholas Ray, Jacques Tourneur, Anthony Mann, Vincente Minnelli – all deployed style to make art within Hollywood’s artifice, counterpointing the surface structures with underlying layers of meaning. Auteurist critics who mined these strata have rejected Zinnemann because his is a literal-minded cinema of the spectator, where the images and narrative are displayed with craft and artistry, but which do not ask the viewer to participate in completing the equation of form and content. 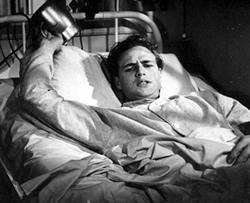 While mainstream American film valorises blatant emotional display – like the anguished outbursts in Rebel Without a Cause (Nicholas Ray, 1955), the sexual hysteria of Splendor In the Grass (Elia Kazan, 1961) or the violent acting out of Raging Bull (Martin Scorsese, 1980) – Zinnemann’s sceptical eye and refusal to indulge histrionics have been interpreted as cold impersonality, and the lapses into sentimentality that mar some of his works have distracted from his achievement. If one starts by looking for a consistent vision and a distinctive style, the rewards start mounting with refined and emotionally expressive images that unite clarity and economy, realist immersion in environment against its opposite lyrical impulse. In The Search (1948), for example, when Montgomery Clift’s kindly G.I. decides he must tell the refugee boy that “Your mother is dead…It’s through your heart that she lives on”, Zinnemann frames the pair with delicate birch trees while a silvery river streams past behind them as quickly as life passes. The beauty of the setting becomes the consolation for the painful message, with Zinnemann’s image forming a poetic correlative for the sympathy we must feel. Process, depicting how things work, provides another subject for his realism, from how paraplegics rehabilitate their bodies in The Men (1950) to how the resistance smuggles clandestine money across borders in Julia (1977). The near military discipline of the novices in The Nun’s Story (1959), trained to proclaim their guilt for breaking the rules and abase themselves in penance, has the psychological reality of enduring boot camp in Stanley Kubrick’s Full Metal Jacket (1987), if not the same idiom. Working out the mechanics of assassination forms the nucleus of Zinnemann’s finely calibrated thriller of process, Day of the Jackal (1973). The film’s absence of stars lends it the same air of abstraction as Alfred Hitchcock’s Topaz (1969), but its pursuit of process became literally merciless, presenting the French and British government bureaucrats who mobilise to foil the assassination as nearly as amoral as the assassin himself. The true subject of Zinnemann scholarship must be to consider the director as both a visual artist and dramatic realist, framed by his association with Robert Flaherty. Following the great documentarian’s insistence on non-studio locations, Zinnemann carried his cameras to European refugee camps in The Search, to rehabilitation hospitals in The Men, and to unemployment offices and a maternity ward in Teresa (1951). In pursuit of a documentary immediacy, Zinnemann also attempted a realism of language, behaviour and gesture by employment of non-professional players (yet also using the most adventurous actors of his time, such as Brando and Clift). a unique combination of the previsualized and the improvisational…He loved chance so much that he frequently shot the rehearsals of a scene…And he loved it when actors bumped into the furniture, when they were not yet familiar with the scene and didn’t know where they were going. He loved that kind of randomness. He said, In life, events are always happening for the first time, they’re not happening for the seventh time (5). Each Zinnemann film has a distinctive look, as the director cast his cinematographer and production designer as carefully as his actors, striving to compress all the cinematic variables – colour, sound, and cutting – into one indelible image or memorable sequence to form the emotional heart of a film. Walter Murch believes that these “two approaches [control and randomness] are not contradictory, but they are creatively opposed – the way a thumb and a forefinger are opposed” (6). Visually, Zinnemann rarely indulges the picturesque, preferring to condense emotion into simple but expressive gestures, compositions, and sequences. 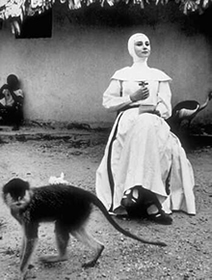 Before considering the arc of Zinnemann’s career, before tracing his progress from neo-realist tendencies to the greater subjectivity and visual complexity in his last films, let us begin at midpoint, at the formidably focused and elegant The Nun’s Story, because it represents a near perfect expression of his vision and the best evidence of Zinnemann’s mastery. From its opening shot of the church reflected upside down in the canal (reprised in A Man For All Seasons), The Nun’s Story emphasizes the “life against nature” within the cloister. A trio form perfectly balances the story – one hour of training and questioning, another of physical and emotional testing in Africa, and a final half hour of resolution in Europe. A believer might shape the trajectory of this story as the rise and fall of a religious vocation, but the secular Zinnemann presents it rather as a fall from the nun’s true path of integrity to herself, followed by the slow rise back. Unique in portraying religion not as an emotional experience but as an intellectual commitment, this film does not treat the audience as the choir that will receive the preaching. Rather, this drama charts the conflict between Sister Luke’s (Audrey Hepburn) integrity and the order’s militaristic demand for surrender to discipline for viewers adult enough to appreciate its painful truths. Nor is the nun depicted in terms of iconography, like Hollywood’s saints in make-up, in this “transcendent film, comparable more to Bergman or Bresson than to anything in the American cinema” (7). When she enrols in the convent’s hermetic social system, the young woman tries to force herself into a life of rules she cannot follow and thus creates her own oppression. Never sentimentalised or ennobled, Sister Luke struggles as persistently and strongly as Prewitt in From Here to Eternity. She has chosen to move through an unforgiving world, aspiring to a purity that is not necessarily admirable. Though Zinnemann does not attempt to diagnose the underpinnings of her need to embrace this life of repression, extinction of self does suggest a quasi-suicidal drive, and the order’s rituals designed to suppress the individual begin to resemble the actions of a cult. However, through the lens of Franz Planer’s camera, the convent ceremonies are composed in depth, all in severe straight lines, capturing the austere beauty of interiors in beige, black and white. Throughout Sister Luke’s thorny interviews with various keepers of the discipline, the camera leans close in as Zinnemann crosscuts to emphasize the gulf separating her from her interlocutor. The intensity grows with each harrowing confrontation as she actively questions, finds subtle traps of paradox (“Pride has not been burnt out of me. When I succeed in obeying, I fail at the same time because I take pride in succeeding”), and then kisses the feet of the other nuns as punishment. Although she is given a whip for private flagellation, the film stops short of following this thread into a pathology of the cloister. Zinnemann simply but unforgettably conveys the horror of a Belgian mental asylum through the deafening sound of women locked inside wooden tubs, beating their heels against the sides while moaning and screaming. Similarly, the director contrives and elongates two instances of violence that function as turning points, releasing the emotional energy of Sister Luke’s interior conflict. In the first, when she suspends discipline by bringing water to a dangerous psychotic called “Archangel Gabriel”, the madwoman seizes her habit and pulls her into the cell, to dark Shostakovich-like stabs in Franz Waxman’s score. But then the music stops as Zinnemann pulls the moment taut, the silence sucking us into the reality as Sister Luke struggles. In fact, the “confrontation is terrifying because it is a nightmarish extension of her struggle with herself” (8) resolved here only when she manages to escape. Just as Sister Luke fights the competing pulls of community and individualism, the film’s visual spectacle is also based on dualities. Europe’s austerely controlled interiors ring with insistent bells (“the voice of God”) that enforce discipline. In opposition, the hot, green fertility of Africa is all exteriors, where even the camera seems to relax, gliding almost casually down open air corridors and across chaotic markets. Where convent orders enforced silence, in the Congo mothers clap and sing, children and animals play, and even the drums themselves speak. Zinnemann manages an extraordinary immediacy of place where it’s impossible to ignore the nuns’ asexual “life against nature”. The Congolese ask the nuns “Where are your husbands?” To them, she is inconceivable as Sister Luke, but must be “Mama” Luke. Violence strikes a second time, and Zinnemann again distends time without resorting to slow motion. A Congolese man, incited by a witch doctor, attacks Sister Luke’s friend, clubbing the nun once, then once more. The moment captures the shock of the unexpected, turning into an awful dance: the nun staggers back as she and the attacker somehow move silently backward through the room until he then administers the final concussive blows. The murder makes the decisive addition to Sister Luke’s inner turmoil, as she faces the emotional test of forgiving the criminal pagan, a contradiction intensified when she learns that the approaching Nazis have machine-gunned her father to death. Back in Belgium, making the final break, she insists to her superiors that “I am no longer a nun”, and Zinnemann now reverses the process followed at the beginning. Leaving the order she once again signs a contract, this time releasing her vows. The convent returns the dowry her father gave, and the pivotal hair-cutting scene that marked her passage into the order is echoed as she removes her veil for the first time in two hours of film, revealing hair now streaked with grey. In the justly famous final shot, now dressed in street clothes, she walks out the door carrying one suitcase, moving away from the camera and into the street, where she turns a corner to her new life. In the room, only her nun’s robe remains, the wind slightly ruffling the cloth. A final bell tolls: this woman of integrity has chosen our world, with all its imperfections, amidst all the troubling chaos of wartime. It was Zinnemann’s inspiration to detect the frustrated perfectionist in Audrey Hepburn, far removed from her proto-Amélie persona. The actress dimmed her radiant smile to reveal self-doubts, conflicted emotions, intellectual ambition and a steely centre never again accessed by subsequent directors. True to the logic of the character, he put this most glamorous of stars into a world where mirrors are forbidden and holy anorexia encouraged. More than any of his previous or subsequent films, The Nun’s Story shows a Zinnemann tough enough to convey his vision without sentimental compromise. The end is poignant with a sense of resignation, simultaneously bitter but realistic about her future, much like the heroine of Mikio Naruse’s uncompromising When a Woman Ascends the Stairs (1960). No miracle happens for Sister Luke. She has faith, it is true, but this does not help her. With the unsparing eye of the rationalist, Zinnemann sees little hope in an afterlife, which makes the moral decisions that dominate his cinema so much more urgent. If no greater authority exists, then we alone bear responsibility for our moral choices, a principle that recurs again and again throughout his works, from Act of Violence to Julia. 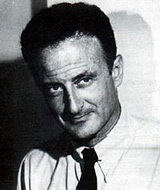 In the three periods of his career – a European apprenticeship, followed by twenty-five years in Hollywood, and another twenty-five of working around the globe with American financing – Zinnemann was a vector connecting Hollywood to the greater world. At the age of twenty, and despite parental disapproval, Zinnemann insisted on his own destiny and set off for Paris to study film. Back in Vienna, he assisted master cameraman Eugen Schüfftan on the independent hit Menschen am Sonntag (1929), collaborating with Billy Wilder, Robert Siodmak and Edgar G. Ulmer. Arriving in New York on the day the stock market crashed, Zinnemann unsuccessfully sought to join the cameraman’s local union (despite the sponsorship of Billy Bitzer). Moving to Hollywood, he first toted a rifle as an extra on All Quiet on the Western Front (Lewis Milestone, 1930), then became assistant and translator for another Austrian émigré, director Berthold Viertel, in whose home he met such artists as Sergei Eisenstein, Greta Garbo, F.W. Murnau and Robert Flaherty, the latter two newly returned from Tahiti with Tabu (1930). Working with Flaherty (on a project that was abandoned) formed what Zinnemann would later call “the most important event of my professional life”. The documentarian’s use of non-professional actors and insistence on authentic locations became a career-long doctrine for Zinnemann (compare the real Congolese lepers he photographed in outcast villages for The Nun’s Story with the tasteful cosmetic lepers William Wyler accepted from MGM that same year in Ben Hur). After a brief stint on The Kid From Spain (Leo McCarey, 1932) – hired to “suggest unusual and exciting camera angles” to Greg Toland and Busby Berkeley – Zinnemann put Flaherty’s principles into practice during a seven month shoot in Mexico. Working with still photographer Paul Strand, at the behest of the progressive Mexican government, Zinnemann directed a dramatised documentary about a village of fishermen, called Redes, literally “Nets” but known in English as The Wave (1934). Back in Hollywood, the resultant film – with no synchronized sound but compromised with unauthorised additions by others – did not leverage him into directing assignments, so he laboured at occasional jobs assisting Henry Hathaway (on Peter Ibbetson, 1935), William Wyler (Dodsworth, 1936) and George Cukor (Camille, 1936). The latter MGM connection led to a position alongside colleagues Jacques Tourneur, Jules Dassin and George Sidney in the studio’s famed training ground, the short subject unit. In eighteen shorts, ranging in subject from insulin to espionage, Zinnemann honed his visual economy and compression, bringing an Academy Award for Best One-Reel Short back to MGM (for That Mothers Might Live). From this period, Wheeler Winston Dixon finds significant experimentation in Zinnemann’s The Lady or the Tiger? (1942), with its “relentless use of wipes of every description (‘burst’ wipes, ‘flip’ wipes, ‘spiral’ wipes, to name but a few optical bench techniques employed in the film”, which he compares to Richard Lester’s A Hard Day’s Night (1964) (9). Wartime manpower demands left an opening for the thirty-five year old Zinnemann to graduate to features with a pair of promising whodunits. Then his A-budget debut came with The Seventh Cross (1944), which depicted an anti-Nazi’s escape from a concentration camp. Boldly rejecting crude stereotypes, the film took the trouble to admit the attractions of the Nazi system, such as social and economic security, for the ordinary German citizen. As insurance for this elaborate production, MGM paired Zinnemann with veteran cameraman Karl Freund, who provokes one of the few negative complaints (“the most objectionable person on the set…loud, slow, and obstreperous”) in Zinnemann’s well-behaved autobiography (10). As a European who had seen continental democracies elect Hitler, Zinnemann’s faith in American democratic ideology was sensibly restrained. He maintained an equally healthy distrust of legal solutions (in Act of Violence, one crooked attorney says, “They got all kinds of laws. They got laws to help people too”). Unknown to Zinnemann at the time he was filming the fog-shrouded camps on the MGM lot, his parents had already perished in the real Nazi counterparts. Replaced by Vincente Minnelli on The Clock (1945), apparently at the request of Judy Garland, Zinnemann then endured suspension to reject bad scripts, but finally found The Search, a Swiss production about the plight of refugee war orphans living in United Nations camps throughout Europe. Purposely made in English to maximise its audience (and centred around a G.I. for American identification), the script was hammered out from stories and details gathered from the refugees in displaced persons’ camps. Zinnemann would employ this same technique of immersion in a milieu to develop the scripts for The Men, Teresa, and Behold a Pale Horse (1964), a practice adopted by Nicholas Ray for Rebel Without a Cause. This research period also served as a way to cast the film with survivors of the concentration camps (11), supplemented by strategic placement of a few experienced actors. At the opening, as a night train arrives at a ruined station, U.N. personnel pull aside the doors of boxcars. Mountains of exhausted children in rags are sleeping piled atop one another, a chilling reminder of the Holocaust (and the director’s first use of railway stations as locales that embody anxiety). Impressively staged in deep focus, the scene shows the traumatized children unloaded in silence, with no sounds except instructions from the workers. Documentary-style interviews follow where the youngsters reveal in a variety of languages their provenance from Dachau and Bergen-Belsen and other death camps. An unforgettable sequence depicts the fearful children at first reluctant to be enclosed in ambulances for transport, then incited to panic by the smell and hiss of exhaust gas inside the vehicle. In their hysteria, the children break the vehicle’s windows, jump out and escape into the ruins. American G.I. Montgomery Clift discovers and befriends one nearly feral boy, while a parallel plot shows the boy’s mother attempting to locate him in the sea of refugee children. What makes the film sentimental is its single-dimensional adult characters, its recourse to a radiantly lit flashback that shows the boy’s family playing chamber music together, reminding us of other idealised MGM households. Zinnemann blamed his producer for adding the bland narration, but the director himself overplays his emotive resources at the finale, with heavenly choirs that swell at the climactic embrace of mother and child, then adds insistent gushing of happy ending falsities that “Everything’s all right now” and “Nothing can happen to you now”. What makes the film quite beautiful, on the other hand, are the wholly convincing performances of three children, real refugees with years of bitter experience in their eyes and demeanour: a rail-thin French speaker, a wary Polish speaker (a Jewish survivor masquerading as an altar boy), and the sad-eyed Czech boy at the centre. With unobtrusive technique (12), Zinnemann poses visual barriers – fences, prison bars, railings, gates and wires – but then finds a simple means to externalise the boy’s mental state. The child is absently drawing lines on paper, but when he crosshatches them, his anxiety mounts as he realizes he is drawing the fence where he last saw his mother. Though unquestionably more conventional, Zinnemann’s film nevertheless has many correspondences to Roberto Rossellini’s Germany Year Zero, released the previous year. The children at the heart of both films personify innocence damaged, both victims of war trauma. Rossellini’s German boy unwittingly embodies his country’s guilt while we witness his innocence twisted and destroyed, with hints at sexual exploitation. As a child, he allows others to interpret the world for him, blindly ending his fragile father’s misery for the supposed greater good of the family. Ultimately, when he sees how this action has contradicted his humanity, his despair (and the director’s for the world) leads him to destroy himself. The Czech boy in The Search has no defences left either, but he has turned inward. The world moves around him, but he is lost without even the memory of his parents. Zinnemann wants to illustrate the pathos of the child’s specific situation, unsettling our emotions, while the more ambitious Rossellini seeks to subvert our very notion of the world. If Zinnemann’s climactic reintegration of the family seems optimistic compared to Rossellini, the numerous images throughout The Search of homeless, stateless and parentless children serve to destabilize the immediate emotional satisfaction (and without appeal to social or religious pieties), much like the more conventional Vittorio De Sica of Sciuscia (Shoeshine, 1946). While The Search shows reconciliation, the reunion in Act of Violence (1949) condenses America’s troubled post-war uncertainty and returning veteran malaise into gripping film noir. The dream of suburban affluence for Van Heflin’s building contractor gets corrupted when his wartime betrayal of comrades is exposed, like the worm within the rose. His suburban home turns from refuge into trap as he tries to escape his pursuer (and Zinnemann’s framing keeps connecting the spaces between them). Like John Garfield’s guilt-wracked protagonist in Abraham Polonsky’s Force of Evil (1948), he keeps descending stairs into the squalor of the urban underworld, until he hits bottom in a rail yard, which becomes a noir-soaked nightmare where “[l]ong takes combined with a near-total absence of conventional dialogue editing create a quality of thickened time that is marvellously appropriate to the film’s dreamlike action” (13). (A Hatful of Rain  presents another war veteran with a secret that overturns the security of the home, and another wife who fights to preserve the family). [i]t is this sense of difficulty which sets The Men apart from other ‘social problem’ Hollywood films of the period, which tend to pose these problems in order to assert that they are all soluble. Zinnemann’s films are never that assertive. They are individualistic but unlike, say, Kazan’s, they are about the difficulties, limits and social impotence of individualism, not the triumph (14). Compare the mature resolution of The Men with the triumphalist ending of On the Waterfront (Elia Kazan, 1954). The most famous image Zinnemann created – the surf sensuously washing over the bodies of Deborah Kerr and Burt Lancaster – stimulated a sexual frisson felt around the world. The shot lasts only seconds but its frank eroticism almost atones for the other compromises that were necessary to bring From Here to Eternity (1953) to the screen. Thus, Hawaiian brothels become “social clubs” where randy soldiers compete to book “conversation” time with the “hostesses”. These Production Code-driven evasions, the cost of doing business in Hollywood, also bedevil Raoul Walsh’s The Revolt of Mamie Stover (1956) but seem less damaging there because Walsh steamrolls over the improbabilities to emphasise the melodramatic contours of the characters. The wonder is that Zinnemann still manages to question the means and goals of the American military at the very height of the superpatriot McCarthy era. Yet for all its notoriety, From Here to Eternity deals more with the contending mindsets that get in the way of love rather than with love itself. As played by Kerr and Lancaster, Karen and Warden are absorbed in their awkward adultery, proposing unrealistic plans to continue the affair, but finally accept that they have no future together. Montgomery Clift and Donna Reed enact a different story of the soldier and the princess, but it also founders on the rocks of reality. When he hears news of the Pearl Harbor attack, Prewitt’s identity as a soldier asserts itself, compelling him to give up his episode of playing house with Lorene in favour of returning to his “real” self. 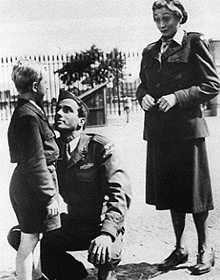 In the film’s curious final scene, Lorene recounts a heroic alternate ending to their relationship, a fantasy wherein brave Prewitt perished as a pilot during the Japanese assault rather than at the hands of nervous American guards. In both male protagonists, the film pivots on integrity to self: despite unconscionable pressure and physical beatings, Prewitt refuses to join the regimental boxing team, while careerist Warden cannot steel himself to accept the hypocrisy of becoming a hated officer, even if it means the end of his love affair. In mainstream Hollywood productions, it takes some courage to show the heroes choosing to fulfil their identity in work rather than in the arms of their lovers. Burt Lancaster also performs a unique drunk scene, showing that as the liquor frees his mind and emotions, his body gets even more rigid. Steve Vineberg has noted Lancaster’s “witty presentation” of his buff physique, especially “the fact that he looks like a walking erection is a great joke in From Here to Eternity” (15). The proliferation of honours heaped on Zinnemann have not helped his reputation in the critical community, especially when more daring artists among his contemporaries like Nicholas Ray, Jacques Tourneur and Anthony Mann received relatively little recognition. Naysayers have found his work variously overdetermined, humourless, linear, too symmetrical and clean-cut, didactic and more schematic than implacable. Andrew Sarris fired the strongest volley in his seminal work, The American Cinema, with his longstanding provocation that Zinnemann’s “true vocation remains the making of antimovies for antimoviegoers” (16), while a few pages later praising the visually static works of Edmund Goulding, such as The Razor’s Edge (1946). For film students like Phillip Lopate, Sarris’s book stood as a reproach: “It was here that we learned to curl our lips at respected names like Fred Zinnemann, David Lean and Stanley Kramer – liberal directors whose hearts and themes may have been in the right place but whose earnestly conventional handling of mise en scène seemed unforgivable” (17). Yet Zinnemann has the artist’s involvement with his own medium, unmistakable in the elegance, concision and seriousness of purpose of The Nun’s Story and Julia. However, his thematic and visual ambitions are also used as sticks to beat his films for old guard pretension and slick technique. In this view, and not without reason, Zinnemann is located within a perceived Tradition of Quality exemplified in Hollywood by George Stevens and William Wyler. Films which seemed to be impressed by their high-profile literary and theatrical pedigrees were famously described by Manny Farber as “white elephant art”, technically accomplished but fundamentally hollow spectacles, “films that do not actively use their visual register to produce meaning” (18). Zinnemann’s prime candidate for white elephant status is the bloated fantasy of Oklahoma! (1955), where cowboy Curly (Gordon MacRae) and farm girl Laurey (Shirley Jones) flirt amidst the pristine cornfields in the ostensible simplicity of romance. As the first Rodgers and Hammerstein collaboration allowed to reach the screen, and personally supervised by the authors, the record-breaking stage musical was widely expected to be a sure-fire hit. Both financially and artistically, however, the resulting film proved only fitfully successful, despite its introduction of the new Todd-AO widescreen process. Clearly, Zinnemann’s strength was as a realist who fought stereotypes, not as a purveyor of mythic Americana. After all, he spent a career dramatising subtle truths: not all handicapped people need be helpless (The Men), not all soldiers act valiantly (From Here to Eternity), not all religious commitment leads to fulfilment (The Nun’s Story), and not all Germans understood the consequences of Hitler’s making the trains run on time (The Seventh Cross). By concentrating on the dark character of Jud the farmhand, the only one with shadowy morals and psychological depth in Oklahoma!, Zinnemann throws the project off onto the path of abnormal psychology, making the sunnier songs sound even more simplistic than Oscar Hammerstein’s hearty lyrics make them. The stage show’s conceit of the virginal heroine’s Freudian nightmare, with dancers assuming the roles of Curly and Laurey, all set in a stylised painted landscape, makes a tonal intrusion in the story, especially with non-dancer Rod Steiger alone among the principals taking part. It seems to belong not only in another kind of film but in another concept of the musical. Adding a darker subtext to the outwardly optimistic Broadway kitsch seems a pretentious grasp at significance (no one in the audience wants this Freudian angle). The ballet, constrained by its stage bound conception, becomes the film’s sore thumb, standing out like the more effective Salvador Dali sequence in Spellbound (Hitchcock, 1945). Indeed, for a motion picture committed to glorifying the outdoors, the characters surprisingly interact with each other rather than their environment. Even the most exuberant number, “Everything’s Up to Date In Kansas City”, though animated by the dynamic dancing of Gene Nelson atop a railroad car, exists in a curiously flat dimension, not opening to the space that dance musicals should unlock. Another landmark of middlebrow culture was Ernest Hemingway’s The Old Man and the Sea (1958), yet when circumstances demanded that he violate Flaherty-like authenticity, Zinnemann preferred to abandon the production. Weighing the constellation of problems – the inability to find a suitable great fish, the difficulties of shooting on the open seas, and the inappropriately well-fed person of Spencer Tracy – he sensibly concluded that it “made little sense to proceed with a robot pretending to be a fish in a studio tank pretending to be the Gulf Stream with an actor pretending to be a fisherman” (19), leaving it to John Sturges to finish that plodding adaptation. Through the ensuing decades, the director’s neo-realism lapsed, with non-professional actors confined to filling out the background. However, with his final two films, the neat, overdetermined compositions that marked Act of Violence and High Noon had clearly loosened, with images that look increasingly sensual, denser and richer. Like The Nun’s Story nearly twenty years earlier, the ambitious Julia recounts the birth of social activism in a woman who is seeking her own identity. It’s the story of activist vs. artist, of the eponymous Julia (Vanessa Redgrave) whose opposition to the rising fascism in Europe burns like a blowtorch, and her influence on childhood friend and playwright Lillian (Jane Fonda). Opening with a massive locomotive as it advances on silvery rails, chugging forth huge bursts of smoke, the film matches the images with a wealth of offhand behavioural detail, employing unexpected beats, emotional shifts, and unpredictable flashbacks. Especially successful is the subtle but loving tension between Hellman’s writing frustrations and the grown up byplay with her lover/mentor, the acerbic Hammett. Especially unsuccessful, however, are the flashbacks where teenage actresses are burdened with convincing us that they would grow up to become Fonda and Redgrave. Zinnemann maddeningly steers the film between scenes suffused with heartfelt emotion and then banal correspondences of image and meaning. Coupled with the political activism of the two stars and the prestige of playwright Lillian Hellman, this film became both a popular hit and the target of withering criticism (20). Zinnemann’s style undeniably sentimentalises with opulence, contradicting the painful content of fascist bullying and violence with overlit photography, decorative backlighting and glamorous soft focus. Shorthand clichés also disappoint, as when a bal musette accordion reliably pipes on the soundtrack to indicate the scene shifting to Paris, nor is there any doubt we’re still in the New Deal years when a background calendar pictures President Roosevelt. Yet the performances remain fresh and powerful, the train adventure is pulse-pounding, and Zinnemann demonstrates the power of restraint in the unsparing funeral home scene where Lillian must claim her friends’ corpse, her grief and anger mounting when she reaches her hand into the coffin to touch Julia’s wounded face. More remarkable is how Zinnemann subverts the usual cues that help us construct passing perceptions into a coherent narrative. Everything is here thrown into doubt. Why doesn’t Julia’s butler remember her? How can the hospital claim it has no record of Julia, when we saw her there? Who is the stranger who mysteriously made a hotel reservation for Lillian? Is Julia’s family really not in town? When her cabin-mates on the train pose cryptic questions (“This is Compartment F. Do you not want Compartment F?”), Lillian cannot be certain whether to trust them as allies or suspect them as enemies. The justly famous eleven minute reunion scene in a smoky Berlin café, with its shock that Julia’s leg has been amputated, also pushes and pulls between conflicting feelings of love reaffirmed and imminent danger. Julia both participates in the emotional moment with her old friend, yet also acts from a hidden agenda, alert for signs and people in the café, all the while stage-managing the deception of their clandestine business as an innocent encounter. Absence and loss accumulate, terminating in Lillian’s attempt to find Julia’s daughter. Once again a child is also lost, as the heroine’s fruitless search across Europe for her own namesake mirrors the Czech mother’s quest in The Search. Like Howard Hawks, Zinnemann made films in the eternal present tense (in fact, Sister Luke is commanded to forget her memories). Injustices in the past may haunt the protagonists of The Search, Act of Violence and High Noon, but it is not until Julia, Zinnemann’s penultimate film, that flashbacks predominate. Memory becomes the organising principle, as six distinct time periods overlap, both visually and aurally, in an allusive style recalling the memory structure of Resnais’ Muriel (1963), just as Zinnemann’s Behold a Pale Horse anticipated Resnais’ La Guerre est finie (1966), with its Spanish Civil War veteran’s crisis of inaction and mounting irrelevance. Shifts in time and space between scenes are signalled with dissolves, not cuts or fades which would have the effect of separating images. The dissolve does not merely connect the shifting time frames of the narrative and the differing spaces of its scenes, but it does so in a way that superimposes the images over top of one another…the dissolve suggests the continuing presence and reality of the past, its endurance into and within the present (21). Thus, the past is experienced as a continuum of sensations, unexpected associations, and surprise intrusions of memory. The haunting final shot of Julia has a Japanese look, like a stray frame from Mizoguchi’s Sansho Dayu (1954), as lake water ripples slightly against a rowboat, set amongst reeds and a spindly pier at one side. 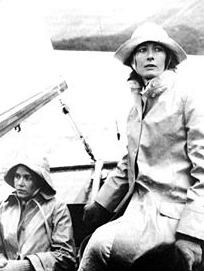 We see only the back of Lillian fishing from the boat; like so many other Zinnemann protagonists, she continues alone, now that Julia and Hammett and the others are dead. With mountains rising from the blue mist on the horizon, the hushed moment feels like a valedictory to the generation – Zinnemann’s generation – that lived through the events of the twentieth century. As Georges Delerue’s yearning theme plays with gravity, the shot hums with poignancy for the ultimate long absence awaiting everyone. Zinnemann’s final film, the autumnal Five Days One Summer (1982), reaches back to the Alpine climbing films of his youth, such as Arnold Fanck’s Der heilige Berg (1926) and Luis Trenker’s Der Rebell (1932). With a newly tactile sophistication, he extends the moment when a necklace breaks and sends beads sliding off the string to the floor, turning their noisy disorder into a striking symbol of the passion unleashed in the film’s love triangle. But the most arresting and original image, one that unites memory and time, occupies the core of the film without actually arising from the plot. A young man’s body is discovered inside a glacier, a climber who had been lost decades in the past. The ice has preserved his youth, but his fiancée who comes to view the body of her lover is now a white-haired old woman. This touching contrast joins (yet disconnects) the past and the present, opposes preservation to deterioration, and juxtaposes youth and age. In this one image, Zinnemann crystallizes cruel mortality in ice. The filmmaker himself, with his cultivation, intelligence, and commitment to reason and authenticity, now lies frozen in time, motionless and silent for our contemplation, like his mountaineer inside the glacier. Paul Arthur, “Noir Happens: Fred Zinnemann’s Act of Violence”, Film Comment, July–August 1999, vol. 35, no. 4, p. 58. Michael F. Blake, Code of Honor: The Making of Three Great American Westerns, Lanham, Maryland, Taylor Trade, 2003. Phillip Drummond, High Noon, BFI Film Classics, London, BFI Publishing, 1997. John Fitzpatrick, “Fred Zinnemann” in Jean-Pierre Coursodon with Pierre Sauvage, (eds. ), American Directors, Vol. II, New York, McGraw-Hill, 1983, pp. 378–386. Louis Giannetti, “Films of Conscience: The Cinema of Fred Zinnemann”, Masters of the American Cinema, Englewood Cliffs, N.J., Prentice-Hall, 1981, pp. 354–74. Sam B. Girgus, Hollywood Renaissance: The Cinema of Democracy in the Era of Ford, Capra, and Kazan, New York, Cambridge University Press, 1998. Robert Horton, “Fred Zinnemann: Day of the Craftsman”, Film Comment, September–October 1997, vol. 33, no. 5, pp. 60–67. Arthur Noletti Jr. (ed. ), The Films of Fred Zinnemann: Critical Perspectives, Albany, State University of New York Press, 1999. Michael Ondaatje, The Conversations: Walter Murch and the Art of Editing Film, New York, Alfred A. Knopf, 2002. Andrew Sarris, “Fred Zinnemann” in The American Cinema: Directors and Directions 1929–1968, New York, E.P. Dutton, 1968, pp. 168–9. Neil Sinyard, Fred Zinnemann: Films of Character and Conscience, Jefferson, North Carolina, McFarland & Company, 2003. Anthony Slide (ed. ), Selected Film Criticism: Foreign Films 1930–1950, Metuchen, N.J., Scarecrow Press, 1984. Fred Zinnemann, “Fred Zinnemann”, American Film, vol. 11, no. 4, January–February 1986, pp.12–13, 62, 66–67. Fred Zinnemann, An Autobiography, London, Bloomsbury, 1992. Article by Gary Johnson, from Images journal. Fred Zinnemann, “Fred Zinnemann”, American Film, vol. 11, no. 4, January–February 1986, p. 13. Fred Zinnemann, An Autobiography, London, Bloomsbury, 1992, p. 108. Neil Sinyard, Fred Zinnemann: Films of Character and Conscience, Jefferson, North Carolina, McFarland & Company, 2003, p. 95. Michael Ondaatje, The Conversations: Walter Murch and the Art of Editing Film, New York, Alfred A. Knopf, 2002, pp. 223–6. John Fitzpatrick, “Fred Zinnemann” in Jean-Pierre Coursodon with Pierre Sauvage (eds), American Directors, Vol. II, McGraw-Hill, New York, 1983, p. 384. Wheeler Winston Dixon, “Early Films of Fred Zinnemann” in Arthur Noletti Jr. (ed. ), The Films of Fred Zinnemann: Critical Perspectives, Albany, State University of New York Press, 1999, p. 39. Zinnemann, An Autobiography, p. 52. “Regulations forbid paying DP children to work, so the only reward the film-makers could give their children were gifts of food, watches, toys.” Fortnight, vol. 5, no. 2, July 16, 1948, in Anthony Slide (ed. ), Selected Film Criticism: Foreign Films 1930-1950, Metuchen, N.J., Scarecrow Press, 1984, p. 162. 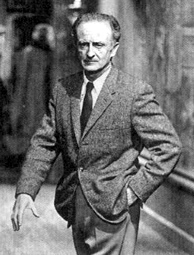 “For Zinnemann, realism contained both an ethic and an aesthetic – the images were to be honestly obtained by abstaining from elaborate and self-conscious formal manipulations and were to be grounded in real, lived human experience.” Stephen Prince, “Historical Perspective in High Noon” in Noletti, p. 81. Steve Vineberg, “Fred Zinnemann’s Actors”, in Noletti, p. 228. Andrew Sarris, The American Cinema: Directors and Directions 1929–1968, New York, E.P. Dutton, 1968, p. 169. Phillip Lopate, Totally, Tenderly, Tragically: Essays and Criticism from a Lifelong Love Affair with the Movies, New York, Anchor Books, 1998, p. 11. Barbara Klinger, “Cinema/Ideology/Criticism” Revisited: The Progressive Genre” in Barry Keith Grant (ed.) Film Genre Reader III, Austin, University of Texas Press, 2003, p. 84. Zinnemann, An Autobiography, p. 150. John Simon writes that Julia “can function only as a comic-strip version of what it is like to be a famous writer, or a dedicated anti-Nazi fighter… Zinnemann, who many years ago was able to make decent pictures, now chokes on his own portentousness”. John Simon, Reverse Angle, New York, Clarkson N. Potter, 1982, p. 339. Stephen Prince, “’Do You Understand?’ History and Memory in Julia (1977)”, in Noletti, p. 192.